K.D. Devapriya -Kataragama Roving Corr. 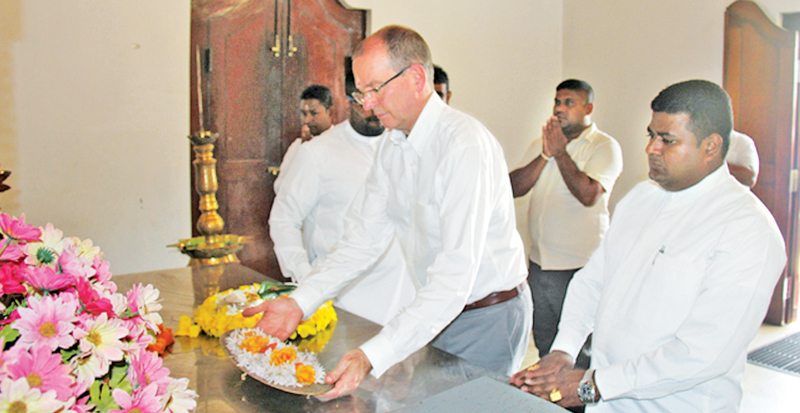 Canadian High Commissioner David Mackinnon offers a tray of flowers at Ruhunu Maha Kataragama Devalaya yesterday. Picture by Kataragama Roving Corr. Canadian High Commissioner David Mackinnon visited Kataragama on an inspection tour yesterday to facilitate several new development projects in the area. He first visited the Kataragama Pradeshiya Sabha and held discussions with Pradeshiya Sabha Chairman Amil Rangana and former Uva Chief Minister Shashindra Rajapaksa to ascertain the development needs of the area. The discussions centred round the launching of several self-employment schemes for women and improving infrastructure facilities for pilgrims visiting Kataragama, for which he sought guidance from them. Thereafter, the High Commissioner visited the Ruhunu Maha Kataragama Devalaya and offered a tray of flowers at the Devalaya. He was earlier received at the Devalaya premises by Basnayake Nilame Dilruwan Rajapaksa. The High Commissioner also held discussions with the Basnayake Nilame and promised to grant assistance towards the development of the Devalaya precincts to keep it clean and tidy. Later the High Commissioner also called on Kataragama Abhinawarama Viharadhipathi Ven. Kapugama Saranatissa Thera at his aramaya and received his blessings. This was the High Commissioner’s first visit to the South after his posting to Sri Lanka.